In addition to her many family links with Tonbridge, Jane Austen encountered a number of other Tonbridge people in the course of her life, including the three listed here. She was also acquainted with the works of Tonbridge School headmaster Vicesimus Knox II. James Stanier Clarke was a boy at Tonbridge School in 1778. He went on to become a naval chaplain and a writer. He had some correspondence with Jane Austen in his role as domestic chaplain to the Prince Regent, later George IV. The prince was an admirer of Jane’s work and she agreed, without much enthusiasm, to dedicate her book Emma to him. Clark was a somewhat pompous and thick-skinned character, not unlike Mr Collins of Pride and Prejudice. His suggestion to Jane that she should include a clergyman, presumably based on himself, in a future novel, was politely declined. 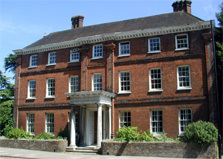 Ferox Hall, Tonbridge, home of the Children family until they were forced to sell it after the collapse of the Tonbridge Bank in 1816. John George Children was a member of a well-known local family who lived in Ferox Hall opposite Tonbridge School. He was a scientist and also the father of the pioneering botanist and photographer Anna Atkins. There were some family marriage links between the Childrens and the Austens, and George Children, father of John George, was a pupil at the school when Jane's father taught there. Jane made a humorous passing reference to John George's marriage in 1796 in one of her letters, poking fun at his double christian name. If Jane Austen ever came to Tonbridge she might well have called on John George Children whose home was only 50 yards from that of her father’s cousin Henry. John Papillon was the vicar of Tonbridge from 1791-1802 and was a very distant cousin of the Austens. Through this connection he was offered the living of Chawton in Hampshire. When Jane and her mother and sister went to live in Chawton after her father's death, she came to know him well. As a bachelor he was thought an eligible match for Jane and a running family joke on this subject appears in her letters. His anxious personality – ‘nervous and fidgetty’ – meant this was never a serious possibility, though Jane did come to know him well.